"Barber who owns a Rolls Royce, BMW and Mercedes | Barber who owns a Rolls Royce | barber who owns rolls | Barber Ramesh Babu"
As a professional barber, he doesn’t want to forget his roots He personally styles the hair of his regular customers. Like he has been doing every day for the past 25 years, Ramesh Babu spends at least five hours daily in his tastefully done but no-frills saloon. On most days, however, Ramesh drives to work in an egg-white Rolls Royce Ghost, handling the controls on the car’s spiffy dashboard with the same deft touch and care as when he is shaping somebody’s coif. The Rolls costs Rs 3.1 crore and there are only five other people in Bangalore who own such a pedigreed car. The 40-year-old bought the Rolls a few months back with his own hard-earnedmoney, supplemented by a huge bank loan with a monthly pay-back instalment of Rs 7 lakh. His earnings from the saloon are quite modest, but Ramesh, who networks well with the rich clientele of the elite Bowring Institute, has built a lucrative luxury car rental business. But mainly, the man has a collector’s passion for fancy cars. And if there is some social prestige attached to it, then he’s not complaining. “Let me enjoy the comfort of a Rolls Royce which was restricted to rajas and maharajas in the past,” Ramesh told Bangalore Mirror. 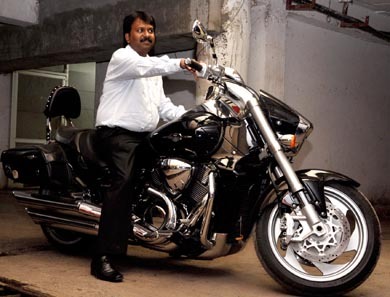 Next year, Ramesh is planning to buy a stretch limousine worth around Rs 8 to 9 crore. Currently, he has a fleet that includes Mercedes Benz (E,S and Viano series) and BMW (5 & 7 series). He hires out these cars to corporates through a travel agency. The Rolls, however, he rents out sparingly. He charges Rs 75,000 for a day for the Rolls when it is let out and his usual clients are corporate bigwigs and visiting Bollywood and Tollywood stars. The last High Net Worth Individual who hired his Rolls was Hero Honda’s chairman who was in town during the World Cup India-England clash. The other notables in the city who own a Rolls include top builder Dayanand Pai, Royal Orchid Hotel’s owner Baljee and Gold Finch Hotel owner Prakash Shetty. Ramesh also owns a Suzuki Intruder high-end bike costing Rs 16 lakh. He rides this bike during weekends and it’s purely for his private use though occasionally he lets some of his close friends enjoy a ride. Meanwhile, his two-year-old son already seems to share his father’s passion. He effortlessly identifies each and every car in Ramesh’s fancy fleet. Inside the saloon, as he dons his black overalls, Ramesh seamlessly makes the switch from Rolls Royce owner to barber. “Even today, I cut the hair of my regular customers for just Rs 65. I can easily hike my rates but I don’t. It’s the family trade. And if I don’t cut someone’s hair on a particular day, I won’t be able to sleep,” Ramesh confessed. No matter that gleaming Rolls parked outside, his head surely is in the right place. When his father died in 1979, Ramesh, a nine year-old boy, was literally on the streets. The barber shop his father ran on Brigade Road’s St Patrick’s Complex was rented out for Rs 5 per day. Ramesh’s family survived on that money. After completing SSLC, he quit studying and like his father became a full-time barber. He became a hair stylist subsequently. His fortunes changed in 1994, when taking a leaf from his uncle who rented out cars, be bought a a Maruti Omni van and started renting it out. From there began Ramesh’s tryst with cars. Even now, he has the Omni with him. In 1996, he started a saloon at Bowring Institute and has not looked back since. 0 Response to "Barber who owns a Rolls Royce, BMW and Mercedes, Barber who owns a Rolls Royce, barber who owns rolls, barber ramesh babu"